"The first time I took Kira to Dr. Strubel, I had to carry her. Her hind legs had almost completely stopped working. She was bearing barely any weight on her right rear foot and her left rear was bloody from scraping her knuckles while walking. It was very sad and, I thought, hopeless. Today, less than 3 months later, Kira is on the right drugs, is pain free, walking and even climbing stairs on her own. She wears the prosthetics Dr. Strubel crafted with Velcro and rubber bands. They keep her rear toes up so she can walk properly. Kira's journey back to mobility has had many chapters. First and foremost were and are weekly swims at the Rex Center, in Pacifica. We (her family) built a "waggin wagon" with a wagon and plywood so her bed could fit on top. This got us out of the house for walks and fresh air. Dr. Strubel got Kira's pain under control and we started gentle massage and stretching at home. Next came the DIY "toe ups" prosthetics and exercises. We just started our third round of exercises that includes walking backwards and sideways; movements I thought she'd never perform again. It's amazing to see Kira improve every day. Our neighbors have noticed her progress and are so happy to see her out and about. Our UPS driver even stopped his truck to come over and pet her! Dr. Strubel has shown us what's possible. My dog is thriving today because of the wonderful care she's received from Dr. Strubel, A Well Adjusted Pet, and the Rex Center." Kira is a 14 year old senior dog who had been progressively losing the use of her rear legs over a 6-month period. Non-steroidal anti-inflammatory medication had helped her with moving around on her own fairly well until suddenly one morning her spinal arthritis robbed her of function in her rear limbs completely and her quality of life was severely reduced. She was switched to prednisone by her veterinarian, and she did improve somewhat, but was still very weak and would try to stand up to walk but fall easily and she was "a danger to herself,” according to her mom. Swimming at the Rex Center swimming pool helped her to feel a bit better, however she still could not walk or stand up on her own without maximal assistance from her mom or dad. However, upon seeing her for an Initial Physical Rehabilitation Consultation, I knew we could vastly improve Kira's daily function and mobility, and I drew up a treatment plan to help get her walking again...starting with her toes! They had begun to curl under from disuse and tendon contracture so we started with range of motion for each toe and assisted standing exercises to encourage full weight bearing in all of her joints. Additionally a big interest of mine is the use of veterinary prosthetics and orthotics to help my patients to strengthen and better use their limbs. In Kira's case, she'd lost a great deal of her ‘conscious proprioception’ - the sensory input process from the toes to the brain - that tells a dog which way up her feet are. Kira was not able to sense how best to place her paws as she moved, so she was walking on the tops of her feet, causing painful sores and limiting her ability to get around. So I developed a set of custom 'Toe-Ups', a device that helped Kira tell which way her feet should be placed before she put weight on them. Very quickly, she gained in confidence and was able to start taking steps with her feet in the correct position on her own as well as going up and down the back porch steps using her rear legs with much less assistance! I also added other arthritis pain medications - Tramadol, Gabapentin, as well as Adequan - and Standard Process Musculoskeletal Support supplements to help manage her worsening arthritis pain from a “multimodal” approach. 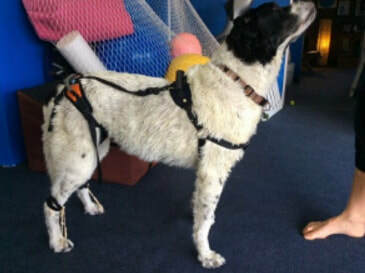 Once we fitted her with her homemade ‘Toe-Ups’ and we eliminated the pain from her walks, she started fully bearing weight on both of her back legs again and was quickly ready to advance in exercises that focused on improving her overall coordination and balance. My treatment plan included targeted home exercises to help her relearn how to deliberately place her legs when moving in different directions and to help her keep her balance. The better her coordination, the less likely Kira would be to trip and fall during routine activities on her own. And as her coordination improved, Kira experienced a regaining of muscle mass and strength: now she is walking more normally, and no longer needs to be carried or pulled in a doggie wagon, her atrophied rear leg muscles are getting stronger and she often tries to run and trot to the park again! She is even trotting right back into the clinic for her physical rehabilitation sessions, which she loves! She hates to say good-bye when it’s time to go home!